A Louis Braille Commemorative Silver Dollar coin in uncirculated condition has been released by the United States Mint in honor of the bicentennial of his birth. Minted as a result of the Louis Braille Bicentennial Braille Literacy Commemorative Coin Act, these coins mark the first time a U.S. coin has included readable Braille, a system used by those visually impaired or blind to be able to read and write. Louis Braille was born with normal eyesight in France in 1809. At the young age of 3, he was left blind in one eye after an accident in his father's workshop. Infection ultimately took the sight from his right eye as well, and before the age of 4, he was completely blind. Fortunate enough to secure a position as a student at the Royal Institute for Blind Children in Paris while still a child, he was not content to just learn by listening. After a visit by a captain in Napoleon's army, a Charles Barbier de la Serre, who showed him a crude method of reading and writing with dots, Braille immediately went to work on perfecting it. Within a few years, he had created a system where each letter and punctuation mark could all be represented by a series of no more than 6 dots in 2 columns. This was to be known as the Braille System, which is still in use today by the blind. 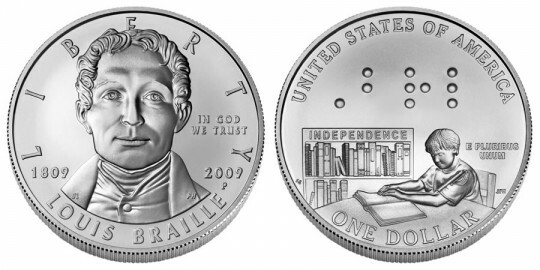 A Louis Braille Bicentennial Silver Dollar Proof version is also available. Update: The year after this strike was released, the US Mint issued four new commemorative coins - one of which was the Disabled Veterans Uncirculated Silver Dollar.